The sunlight glistens across the surface of George Lake in Killarney Provincial Park in Ontario, Canada during a beautiful sunset. George Lake in Killarney Provincial Park in Ontario, Canada is surrounded by a natural environment where the setting of the park has been left untouched by humans. A sunset from the shores of George Lake is breathtaking as the sun slowly dips down behind the hills leaving its sparkling rays of light across the water. Camping at George Lake is beautiful as it is the only front country campground throughout Killarney Provincial Park with 122 sites available. Swimming is great, walking trails through the wilderness are spectacular and every sunset is picturesque over George Lake. Sunset over George Lake in Killarney Provincial Park, Ontario, Canada. Please let me show you more of my pictures from my "photo gallery: Killarney Provincial Park Photos". 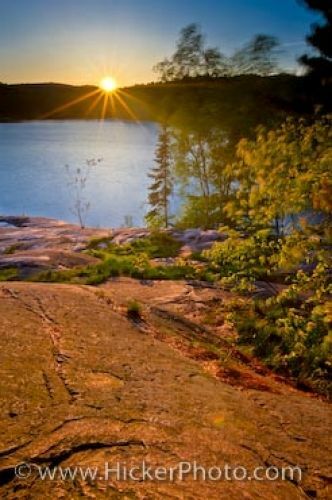 Picture of a beautiful sunset over George Lake in Killarney Provincial Park in Ontario. Pictures from photo gallery "Killarney Provincial Park Photos"